There is nothing new about the administration deciding who gets exemptions and who doesn’t, and that’s the main point. 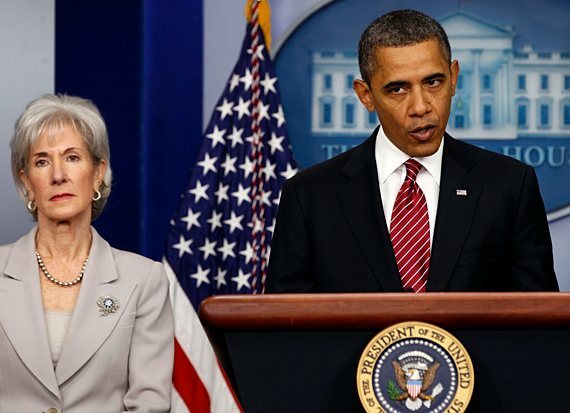 After nearly a year, the Obama administration released, on February 1, its latest version of a “compromise” with the employers who object, on religious grounds, to the Health and Human Services (HHS) mandate that their health plans cover no-cost access to sterilization services and contraceptives, including those that can act as abortifacients, destroying the early-stage embryo. As many observers have already remarked, there is nothing substantively new in the administration’s proposal, which only formalizes and fills in details of a proposal it first floated last March, and continues to be based on the same dubious science. Now facing more than forty lawsuits initiated by colleges, charities, and other religious nonprofits, as well as by for-profit companies whose owners have religiously informed moral objections, the Obama administration may hope that its latest gambit will persuade some credulous judges to toss some of the litigants’ cases. But in truth, it has only revealed its own blinkered and tyrannical understanding of religious freedom, which it would sacrifice to a goal of “gender equality” that is at best only tenuously related to its free-contraception-for-all policy. And, if the judges attend closely to its arguments, it may even have severely weakened its case. Given its stated hostility to any serious understanding of our first freedom, the right not just to worship but to live one’s faith in all one’s daily work, on what understanding of our remaining constitutional freedoms can the administration assure us that any of these other liberties still stands on a firm foundation? Also at Public Discourse was this well-reasoned and extraordinarily well presented analysis. With last Friday’s rules, the government is claiming that after a year of a mostly losing record of religious freedom lawsuits, it has struck the perfect balance between two urgent goals: getting contraception into the hands of as many American women and girls as possible, and protecting Americans’ religious freedom. The truth of the matter is quite different. There are myriad problems inherent in the new rules. They still fail to protect the legally guaranteed religious freedom of religious institutions, for-profit employers, insurers, non-religious non-profit organizations, and individuals. Religious liberty is protected not only by the First Amendment of our Constitution, but also by the Religious Freedom Restoration Act. They fail to understand the full nature of the free exercise of religion—that religion, whether practiced individually or by a group, requires being able to integrate one’s actions with one’s religious beliefs, especially when these don’t attack but advance the common good—here, the health and well-being of women and girls. They trample on parents’ constitutionally-protected right to direct the upbringing of their daughters. And they reveal, still, an irrational zeal for a narrow category of drugs and devices, thus evincing a narrow and harmful understanding of women’s freedom as coincident with sexual expression. Moreover, while the government tries to make us think that the new rules are hospitable to religious freedom, we shouldn’t overlook its continued failure to admit the bankruptcy of the mandate’s grounding “medical” claim: that unintended pregnancy is a kind of health crisis properly resolved with free contraception and early abortions. Thank you, Helen Alvare, for such a sound argument. Cardinal Timothy Dolan, president of the US bishops conference, said this latest attempt for cover is still unacceptable. The Administration’s proposal maintains its inaccurate distinction among religious ministries. It appears to offer second-class status to our first-class institutions in Catholic health care, Catholic education, and Catholic charities. HHS offers what it calls an “accommodation,” rather than accepting the fact that these ministries are integral to our Church and worthy of the same exemption as our Catholic churches. And finally, it seems to take away something that we had previously—the ability of an exempt employer (such as a diocese) to extend its coverage to the employees of a ministry outside the exemption. the bishops explained that the “HHS mandate creates still a third class, those with no conscience protection at all:individuals who, in their daily lives, strive constantly to act in accordance with their faith and moral values.”This includes employers sponsoring and subsidizing the coverage, insurers writing it, and beneficiaries paying individual premiums for it.Friday’s action confirms that HHS has no intention to provide any exemption or accommodation at all to this “third class.”In obedience to our Judeo-Christian heritage, we have consistently taught our people to live their lives during the week to reflect the same beliefs that they proclaim on the Sabbath.We cannot now abandon them to be forced to violate their morally well-informed consciences. For now, this remains necessary. The cases proceed through the courts, and the latest HHS proposal is likely a response to a DC Circuit Court judge who required the government to report back on what ‘accommodations’ it was making that it had promised would be forthcoming. This does not suffice, say Becket Fund attorneys representing the most cases against the federal mandate. Today’s announcement of the Notice of Proposed Rulemaking on the HHS mandate leaves the religious liberty of millions of Americans unprotected. We’re all still reeling from the Administration’s announcement on the HHS Mandate last Friday, which, as it turns out, is 80 pages of nothing new. The Administration’s proposal is murky on the details – in fact, it’s not at all clear how this would work, if it could work at all; but it’s clear that it still fails to protect our nation’s 237-year guarantee of religious liberty for millions of Americans. As I mentioned in my email to you last Friday when the Obama Administration released this proposal “respecting the concerns of some religious organizations,” – their words, my emphasis – the millions of American entrepreneurs who want to live their lives and run their businesses with their faith intact are not covered even a stitch by this proposal. They are still forced to choose between their conscience and their livelihood. 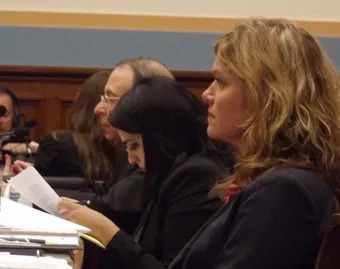 These entrepreneurs are winning big in court – 11 wins for businesspeople of faith to just 3 for the government – yet the Administration still refuses to accept that religious liberty is even at issue in these cases. The government seems to have been so intent on defining religious liberty as narrowly as possible that they’ve drafted a convoluted 80-page proposal riddled with half-baked ideas and vague accounting schemes. …these proposed regulations show the government’s standing obsession with this narrow piece of the Affordable Care Act. From August 2011 to today, the White House and HHS have expended enormous amounts of time, written hundreds of pages of rules and amended rules and “safe harbor” provisions, occupied press conference time, re-election campaign ads, and delivered speeches—all to promote the notion that free contraception and early abortifacients are the near sum of women’s freedom. It’s as clear, and offensive, as that. Early in the film ‘For Greater Glory’ an elderly pastor, warned that Mexican federales were storming toward his church and he faced imminent danger if he did not hide in a nearby home, said he was a priest and was already home, that he belonged in the church. 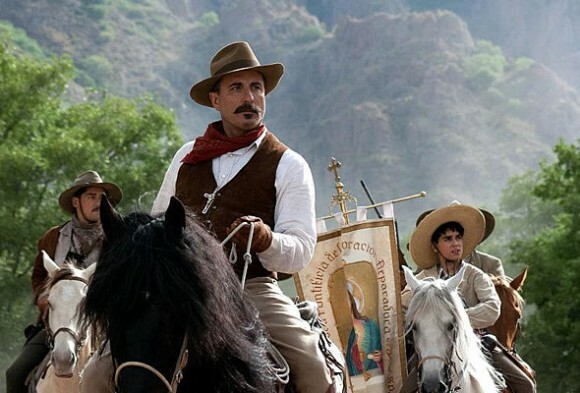 “Who are you if you don’t stand up for what you believe?” That line was symbolic of the entire film and real life Cristeros War it revealed, and emblematic of the present time. The Knights of Columbus played a significant role in the Cristiada, and they do today in the US, in defending religious liberty. That’s the theme that makes this film coming out at this time so…providential. This message is repeated over and over by each of the film’s prominent actors, including Cuban-born Andy Garcia. Same for Mauricio Kuri, who played the role of young martyr ‘Joselito’ Sanchez del Rio. Looking back on the whole experience, Kuri sees Bl. Jose’s true strength as being rooted in his courage to stand up for what he believes in. Kuri encourages Catholics everywhere to stand up for religious freedom like the faithful Catholics of Mexico did during the Cristero War. They are, in astonishing numbers, at the Stand Up For Religious Freedom rallies that went from huge on March 23rd to larger and more passionate last Friday, June 8. From Maine to Miami and Alaska to Honolulu, Americans turned out in public squares to boldly affirm their belief in the constitutional right to religious liberty. The second wave of religious freedom rallies took place on Friday, filling courthouse squares, federal buildings, and university centers from New York to Los Angeles with the Founding Fathers’ views of liberty and conscience. Tens of thousands participated in the more than 150 events organized by the Pro-Life Action League and Citizens for a Pro-Life Society. Actually, leaders of those two groups built a coalition of 65 religious and civil rights organizations, dedicated and determined to defend individuals and institutions from the federal HHS mandate that requires them to violate their consciences. Interesting. Late in the film ‘For Greater Glory’, the Mexican president who launched the ruthless crackdown on religion and people of faith called for a meeting with the famous general who headed the Cristeros in defending religious rights. President Calles presented General Gorostieta with what he called a ‘compromise’, to which Gorostieta responded ‘there is no compromise of liberty.’ Freedom is absolute, he declared, and comes not from the state but from God. Late last Friday when many Americans and certainly church leaders and were preparing for St. Patrick’s Day ceremonies and the fourth Sunday of Lent, the White House dropped a surprise announcement. As if no one would notice. 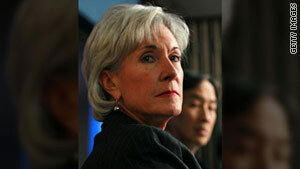 It said, essentially, the president has doubled-down on his already controversial HHS mandate. Instead of broadening the so-called exemption for religious institutions and individuals with moral objections, he broadened the demand for compliance with the mandate. …It outlines three different options to ensure that the health plans for employees and students of religious organizations cover birth control, including abortifacient drugs, and sterilizations, without co-pay. …Sister Mary Ann Walsh, spokeswoman for the U.S. Conference of Catholic Bishops, said she found it unusual the announcement came as part of a Friday news dump on the eve of St. Patrick’s Day. Not for this administration. Especially on this issue. The New York Times calls it a ‘clarification.’ But the opening lines of this piece clarifies nothing, it only repeats what we already knew, but gives the administration another opportunity to claim it’s making an ‘accommodation,’ which it’s not. The new proposal virtually guarantees that birth control will remain an issue in the battle for the White House and Congress. Not exactly. To really clarify, as long as the HHS mandate forces individuals and institutions to violate their consciences and religious liberty rights, government overreach will remain an issue in this election year. Since the administration keeps insisting it made an “exemption” or “accommodation” for religious objection to the Obama contraceptive mandate, let’s take a closer look at what exactly that is. Many religious individuals and organizations that have conscientious objections to abortion object to the use of Plan B and ella because they believe, and scientific evidence supports their belief, that these drugs constitute abortifacents. That is, Plan B and ella can prevent a human embryo, which these religious groups understand to include a fertilized egg before it implants in the uterus, from implanting in the wall of the uterus thereby causing teh death of the embryo. It was precisely these sorts of concerns that were repeatedly articulated by religious groups in the more than 200,000 public comments submitted in response to the amended interim rule. HHS created an exceedingly narrow religious exemption-one that is narrower than any other religious exemption in federal law. Now let’s take a look at what’s footnoted here. It’s remarkably important, and underreported. Until now, federal policy has generally protected the conscience rights of religious institutions and individuals in the health care sector. For example, for 25 years, Congress has protected religious institutions from discrimination (based on their adherence to natural family planning) in foreign aid grant applications. For 12 years Congress has both exempted religious health plans from the contraception mandate in the Federal Employees’ Health Benefit Program and protected individuals covered under other health plans from discrimination based on their refusal to dispense contraception due to religious belief. The HHS mandate is not only unprecedented in federal law, but also broader in scope and narrower in its exemption than all of the 28 State’s comparable laws. Almost half the States do not have a state contraception mandate at all, so there is no need for an exemption. Of the States that have some sort of state contraception mandate (all less sweeping than the federal one here), 19 provide an exemption. Of those 19 States without an exemption, only three (California, New York, and Oregon) define the exemption nearly as narrowly as the federal one, although the federal exemption is still worse because of the regulation’s discretionary language that the government “may” grant an exemption. Moreover, religious organizations in States with a mandate—even those where there is no express exemption—may opt out by simply dropping prescription drug coverage or offering self-insured plans, which are governed by federal ERISA law rather than state law. The federal mandate permits none of these alternatives, and therefore is less protective of religious liberty than any of the States’ policies. …on January 20, 2012, the Administration announced it would not expand the exemption to protect religious schools, colleges, hospitals, and charitable service organizations, but it would give them one extra year to comply with the Mandate. A year to figure out how they’re going to violate their consciences. Uddin makes some very key points here. Untenable (as all Supreme Court justices called it when the Obama administration tried earlier to usurp authority from churches in the unanimous Hosanna Tabor ruling). These lawsuits challenge the government Mandate as a violation of the First Amendment of the U.S. Constitution, the Religious Freedom Restoration Act (RFRA), and the Administrative Procedures Act (APA). The religious freedom claims turn on the fact that the burden placed on these organizations is not justified, as is required by law, by a compelling government interest that is narrowly tailored to serve that interest. Emphasis added. Because though that’s a legal fine point, it’s a very important one. Read the footnote on that. It cites HHS. In fact, the federal government already spends hundreds of millions of dollars each year funding free or nearly free family planning services under its Title X program. Therefore, the issue is not really about access to contraception but rather about who pays for it. Finally, one of the issues that is consistently overlooked when the issue is framed as “women’s rights versus religious freedom” is that women, too, seek the freedom to live in accordance with their sincerely held religious beliefs…As a female member of religious minority, I hold this right to religious freedom particularly dear, as, for example, a Muslim woman’s right to dress as she pleases is restricted by many governments across the world. As it turns out, this conflict is entirely unnecessary. 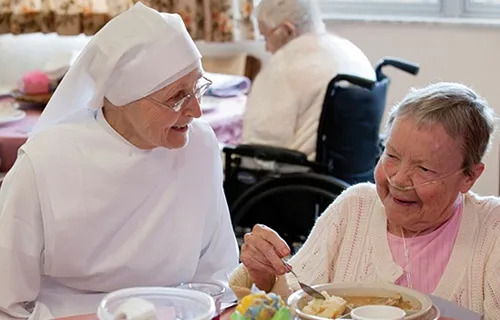 A robust exemption from the HHS Mandate would be a workable way for the federal government to advance both its interest in women’s health and its commitment to respecting the legitimate autonomy and convictions of religious institutions. In particular, expanding the existing “religious employer” exemption into a “religious conviction” exemption would eliminate the conflict entirely. Specifically, the exemption should be expanded to include all individuals and organizations—whether nonprofit or for-profit—that have a sincere religious conviction prohibiting them from purchasing or providing access to the mandated goods and services. In addition, any limitations over how, by whom, and for whom these individuals and organizations carry out their missions should be eliminated. Strong testimony. One wonders who was listening on that committee and in the halls and quarters of Congress. We cerainly are. Pregnancy is not a disease, they said, and this is not “preventive health”, which Congressman Jeff Fortenberry said on my radio show Friday evening just after the House voted on the debt deal. He’s co-author of the Rights of Conscience Act, even more under threat Monday than it was on Friday. The requirement is part of a broad expansion of coverage for women’s preventive care under President Barack Obama’s health care law. A half-century after the advent of the pill, the Obama administration on Monday ushered in a change in women’s health care potentially as transformative: coverage of birth control as prevention, with no copays. 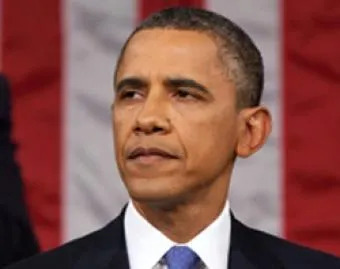 Services ranging from breast pumps for new mothers to counseling on domestic violence were also included in the broad expansion of women’s preventive care under President Barack Obama’s health care overhaul. Since birth control is the most common drug prescribed to women, health plans should make sure it’s readily available, said Health and Human Services Secretary Kathleen Sebelius. “Not doing it would be like not covering flu shots,” she said. Yes, she really said that. It’s tortured logic (apply critical thinking skills to that one). Or it’s Orwellian. Whichever is worse.